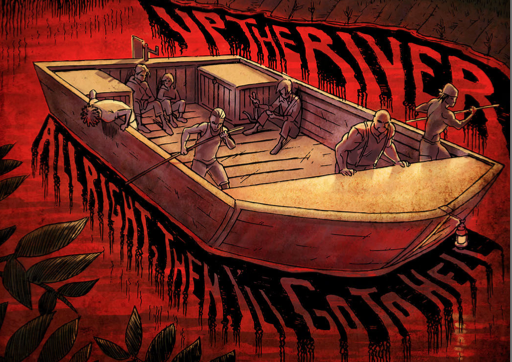 Up The River from Source Point Press is not your average indie comic. Like everything in the industry, “independent comics” have changed over the last fifty years. To even say that there was an indie movement fifty years ago seems like a stretch, but writers and artists like R. Crumb and Harvey Pekar were making their own brand of comic book in the 60’s, an “anti-comic” to the super heroic books that became the industry standard from the big two, challenging what they were doing. In 2015 independent comics are not unusual. Crowd funding options like Kickstarter have made it possible for super specific audience targeting, and the broad net that any creator can cast makes it much easier to reach your audience, to market your book specifically to them. This stuff is no news to Travis McIntire and Stephen Sharar. The writer/artist team behind Up The River are also founding members of the Michigan Comics Collective (MCC), a non-profit organization that looks for Michigan based comic creators and helps them get their work into print and digital form. But the truth of the matter is this, that despite their skill at organizing people, the connections they’ve endorsed, they are creators first. Up The River #1 was released after a tremendously successful Kickstarter campaign that ended in March fully funded and several stretch goals unlocked. You seldom see the stories about KS failures, but to get over-funded is a welcome rarity as well. It’s because this book rocks. Up The River takes place in a world post-zombie apocalypse. (This is not another zombie book. Well, it is, but it’s totally different as well.) People have scattered to small settlements, finding what protection they can from the “lurchers”, and keeping their heads down. The river plays a huge part in the story. The red silt of the river seems to carry the disease. This is “Heart of Darkness” with zombies. McIntire has written a story that is captivating because of its characters. It’s the same reason that I like to read Stephen King or Robert Kirkman. Those two authors take regular people in an extreme circumstance and show how irregular they can be. The group heading up the river is searching for a cure, or at least a cause. They’re doing it because they’ve no choice, and that’s the boat in which McIntire has stranded us, with these men of doubtful integrity, thieves and murderers because that’s what the world is now. The art team of Stephen Sharar and Sean Seal cannot be taken for granted. The overall look of the book is spectacular. Sharar’s pencils and inks leave little doubt to his talent, and I especially loved the page layouts he chose. There’s a sort of flashback page that works perfectly, and he jumps between standard-ish panels to great splashy gory drippy frames. The red silt in the river plays such a key role that Sean Seal colored most of the book in warm hues. There are lots of oranges and yellows, deep reds, because the river itself is red. It’s an interesting choice because reds traditionally emote feelings of power, anger, passion, but most of all danger. These are all high-energy feelings, and that lends itself well to the tense feeling in the book. Up The River #1 breaks the mold of Kickstarter books. Travis McIntire’s story is the kind of story that you want to keep reading. Stephen Sharar’s art is the kind of art that makes you want to turn the page both forward and backward, to see what’s coming next and to go back a look at what you just saw again. Sean Seal’s colors tie both the story and the art into a neat red and dripping package. These guys are creators first. And that’s what you should take away from this. Up The River was created not for the love of money, or to challenge social mores, but for the love of story. This entry was posted in Comic Book Reviews, independent comic, Source Point Press and tagged joshua werner, Sean Seal, source point press, Stephen Sharar, Travis McIntire, Up The River. Bookmark the permalink.